Attention deficit hyperactivity disorder more commonly refereed to as ADHD shortened, ADHD affects 2-5% of school-aged children and young people. It is one of the most common behavioural disorders amongst children with the majority of these being boys. The disorder is usually diagnosed between the ages of three and seven. A person with ADHD usually has symptoms characteristic of one of the three subtypes of the condition. If a child has symptoms of all three behavioural problems – inattentiveness, hyperactivity and impulsiveness – they may have ADHD combined, which is the most common subtype of ADHD. Alternatively, if a child has symptoms of inattentiveness but not hyperactivity or impulsiveness, they may have ADHD mainly inattentive. This form of ADHD is also known as attention deficit disorder (ADD). If a child has ADHD, their symptoms usually become noticeable before the age of seven, with a diagnosis usually made between the ages of three and seven. 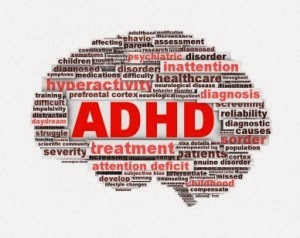 ADHD can cause problems in a child's life, and can often lead to underachievement at school, poor social interaction with other children and adults and problems with discipline. You may wonder why I am writing about this topic? After a lengthily chat with Liam's teacher they have decided to refer him to the GP about his behaviour. I have always know his behaviour is very erratic he has very little concentration and dips from one task to another, he also doesn't like a lot of changes in his life, big changes affect him somewhat, even days out or a change in routine, seems to upset him. I have to prepare him in advance for anything that we are going to do, even if it is just the weekend coming round he gets really upset if I don't remind him that he is not at school or that the next day is Saturday. I will be documenting our journey with the subject and going into more depth with ADHD its diagnosis. Right now as I read down the list Liam ticks nearly all the boxes for ADHD but I am an Adult trained nurse not a child trained nurse nor am I a paediatrician so I guess only time will tell where our journey into this subject is going to take us.